I did it again. We had another session and again found ourselves going for the books a bunch, this time for weapons qualities and descriptions. Three sessions in and we still can't remember all the different special weapon traits. 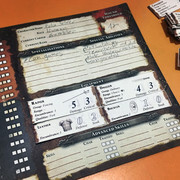 Each card has the important item statistics on the front of it and detailed information of all the item's qualities and special traits on its back.